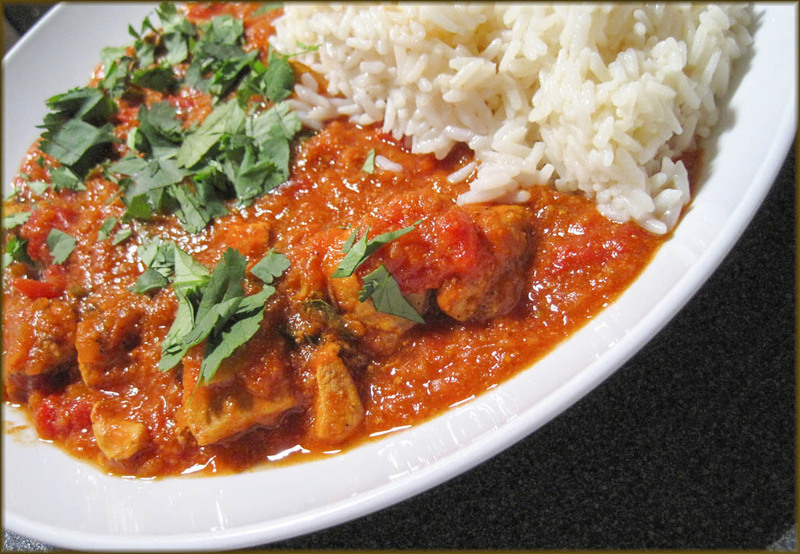 Slow cooker Spicy Chicken Curry adapted from a Gordon Ramsay recipe. A deliciously tasty curry that proves it's well worth the little extra bit of effort toasting spices before adding them and it freezes well too. Adapted from a Gordon Ramsay's Spicy Beef Curry recipe from his book Healthy Appetite. I decided that it could also be made with chicken. So I followed it to a point, then put the lot into a slow cooker. I tried it and it worked! I've changed the amount of liquid used as a slow cooker always makes more liquid. Personally, I'd only use TOTAL Greek yoghurt for this as other brands might split when cooked, especially in a slow cooker. Put the cubed chicken into a bowl and season with salt and pepper. Sprinkle with the garam masala, add the yoghurt and stir to coat the chicken. Cover with cling film and leave to marinate for as long as possible. Over night is good but if not at least an hour. In a dry frying pan over a high heat, toast the cumin, fennel and fenugreek seeds keeping them moving so they don't burn. Just a minute will do just so they are start to smell nice. Now put them into a spice grinder and grind to a fine powder - you don't want any hard bits or it will taste horrid. Stir in turmeric and curry powder, mix well and set aside. Heat a small amount of olive oil in a large frying pan. Add the onions, garlic, ginger and a little seasoning. Give it a good stir and then cover and cook for about 10 minutes until the onions are soft, giving it a stir a couple of times throughout. Stir in the tomato purée and cook for a minute before. Transfer to the slow cooker along with the sugar, the ground spice mix you made earlier, the tomatoes including their juice, stock, cardamom pods, and chillies. Crumble in the dried curry leaves. Throw in the chicken as well as it's marinade and give it all a good stir. If you can cook on High for an hour then turn to Low for the next 5 hours. OR cook on low for 7 hours. Only if you can, stir after about 4 hours. You will probably need to thicken the curry a little. I always use or you can dissolve some cornflour in a really tiny amount of water and stir it through. Sprinkle the chopped coriander leaves on top and serve with some nice rice and home made Garlic and Coriander Naan. You will need a spice grinder for the spices. Sprinkle the chopped coriander leaves on top and serve with some nice rice and my Homemade Garlic and Coriander Naan. Looks mighty tasty Jan! I like to use my slow cooker on Sundays when I know we'll be getting home late and will be positively famished!! I would really love to tuck into a bowl of this right now. I am so sorry I forgot to add you to my blogroll!! I fixed it asap!!! It sounds delicious - i love the way the slow cooker really allows the tastes to develop, so i imagine this would work really well with a curry. Gorgeous! A link is up on my fb comfort food page. This sounds really nice Jan, but my only worry, is~ cooking chicken for so long in a slow cooker does it make the chicken tough?? I have had my chicken in the marinade since last night and was going to make this today, but thought maybe it would be better as a chicken biryani, so going to do that instead with the chicken marinade. Seriously this didn't turn out tough - if you're really worried try it after 6 hours (be sure to cook on low though not the high setting). I hope you give it a go - I know some slow cookers are different to others - I have one that cooks in extra fast time!......NOT quite what you want though sometimes. Mmm this looks lovely and rich Jan! Hi Jan... Am an Indian.. Isn't this an Indian dish??? It looks yummy.. I just got my slow cooker yesterday, and was pondering over recipes to find one to impress hubby for not wasting money on slow cooker and I ended up with urs... Am gonna try now... Thanks for this lovely one..